Noctua announced a partnership with RotoSub to create the first PC fans with active noise cancellation (ANC). A prototype of the technology will be showcased at next week's Computex. Noise reduction specialist RotoSub and renowned quiet cooling fan manufacturer Noctua today announced a strategic partnership agreement for the development and commercialisation of PC fans with integrated Active Noise Cancellation (ANC). A first prototype of a Noctua fan with integrated RotoSub ANC technology will be shown at Computex Taipei next week. 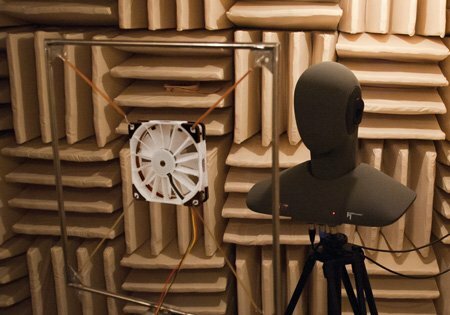 "Mårten Oretorp and Lars Strömbäck's invention is a milestone in the field of noise reduction", says Mag. Roland Mossig, Noctua CEO. "It has always been our goal to push the boundaries of acoustic optimisation and this partnership will allow us to reinforce our technology leadership in the field of premium grade PC cooling equipment." "Noctua is widely recognised as a leader in quiet PC cooling, so they were the obvious candidate when we were looking for a partner to commercialise the technology we've invented", says Lars Strömbäck, RotoSub CEO. "The performance and quality of their fans is one of the best in this industry and their new NF-F12 fan with its FocusedFlow system is ideal for integrating our ANC technology." "Our performance target is to achieve about 80% more airflow and 120% higher static pressure at the same noise level as the original NF-F12", explains Mårten Oretorp, RotoSub CTO. "There is still a lot of fine-tuning to be done, both in structural design and as far as the algorithms that compute the anti-noise signal are concerned, but we're working hard to achieve this goal within the next 12 to 18 months."